My books in print | Steer Forth! 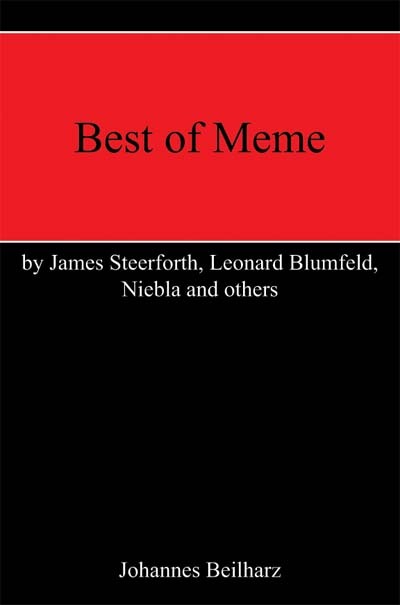 Among the authors of the poems and prose pieces assembled in this anthology are James Steerforth, Leonard Blumfeld, Niebla, Surendra Sparsh, Iself and Felix Morgenstern – all pseudonyms of German writer Johannes Beilharz. These miniatures, which range from humorous to deadpan, satirical to whimsical and spiritual to only beautiful, are the result of his participation in various so-called memes – also referred to as writing or art prompts – in the English-language literary and art blog world in 2007 and 2008. 2008, paperback, 52 pages, $8.95/£4.50/€7.99. ISBN: 978-1-6048-1364-7. Can be ordered directly from Wordclay, the publisher, or from any bookstore or online bookstore, e.g. Amazon US, Amazon UK, Amazon Germany. 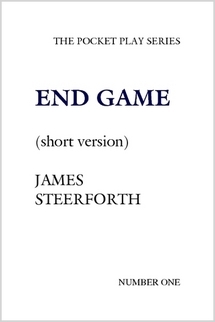 This ultrashort play makes use of certain themes in Samuel Beckett’s well-known play ‘Fin de partie’ (1956), the English title of which is ‘Endgame’, for its own, hopefully somewhat amusing purposes. The Pocket Play Series No. 1. 2007, paperback, 8 pages, $9.34, $5.00 (download). Self-published with Lulu. Can be ordered directly from the publisher.